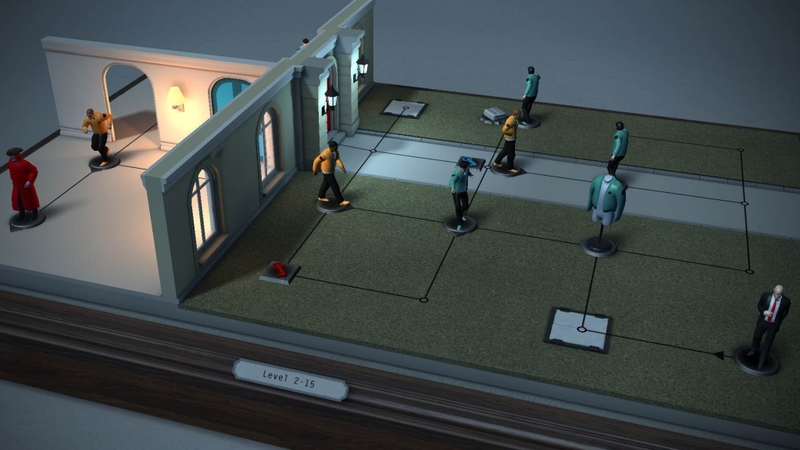 Hitman GO: Definitive Edition is a turn-based puzzle game based on the popular stealth-assassination franchise, Hitman. 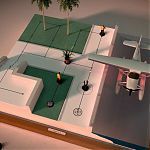 Original released as a mobile game back in 2014, Square have up-resed and remapped the controls for use with consoles and released it as a full blown console title. 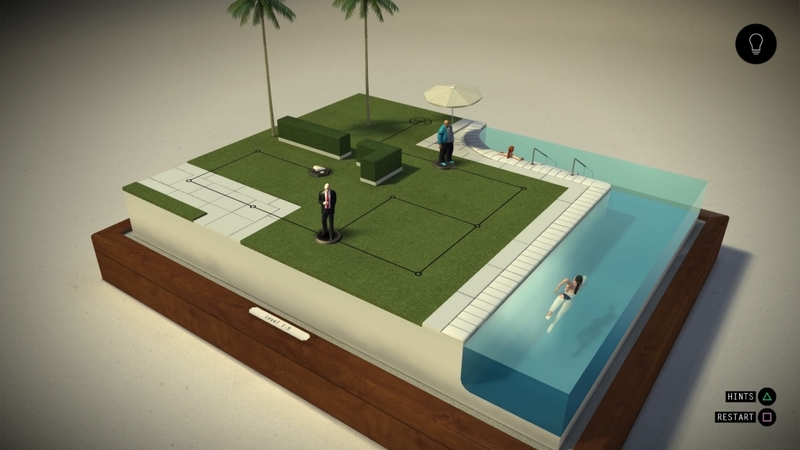 Hitman GO: Definitive Edition’s main protagonist is Agent 47, but with a twist. 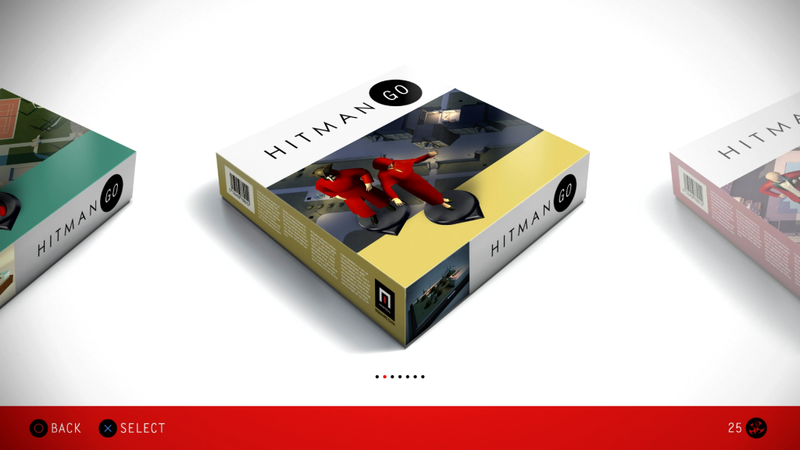 The entire game is presented to the player as a boardgame. Every character on the board, including our sullen assassin is represented as a plastic model. This is really where the similarities end in regards to the franchise. 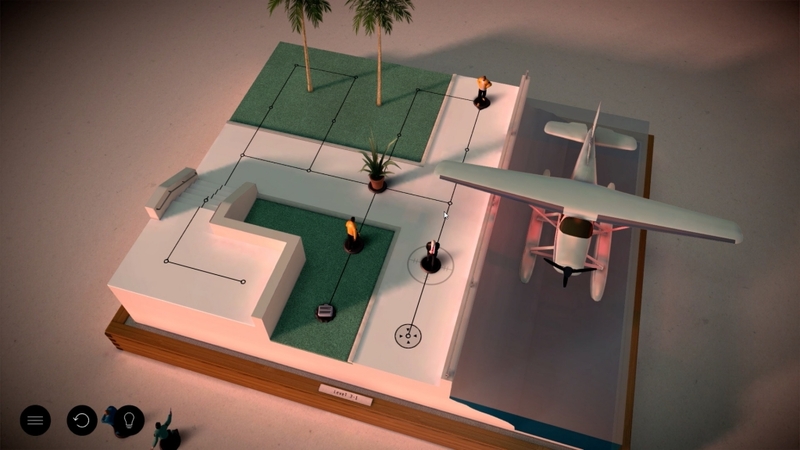 The game board is rendered in a stylised and vibrant way, with a movable camera, giving players the ability to move the camera to view it from different angles using the right stick. The path which Agent 47 can move along is represented by lines on the board with circles, indicating a single ‘space’ that he can move at a time. 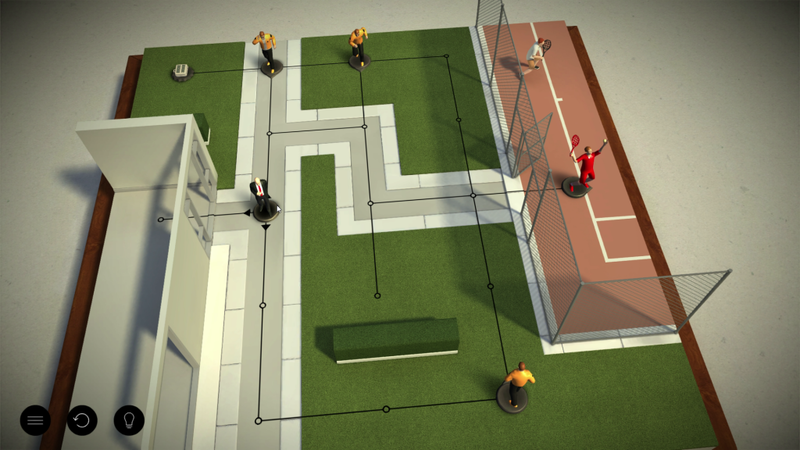 During most levels the objective is to navigate Agent 47 to the exit point without being spotted. 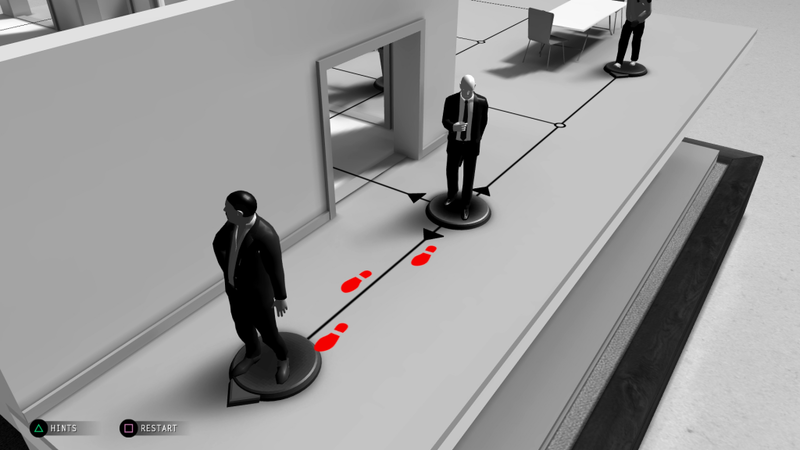 In other levels Agent 47 may need to take out a specific target; usually wearing red items of clothing or he may need to collect an item such as a briefcase before completing a level. 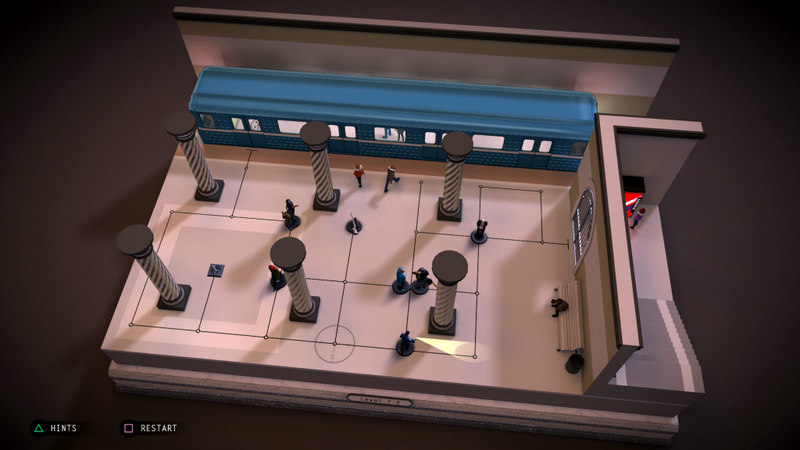 As players progress through the game more and more options are made available to help accomplish each mission. The beginning levels, as you would expect, are pretty simple. Move a few spaces to complete the mission. As you progress through the game the levels get progressively more complex; this is where the puzzle aspect comes into play. 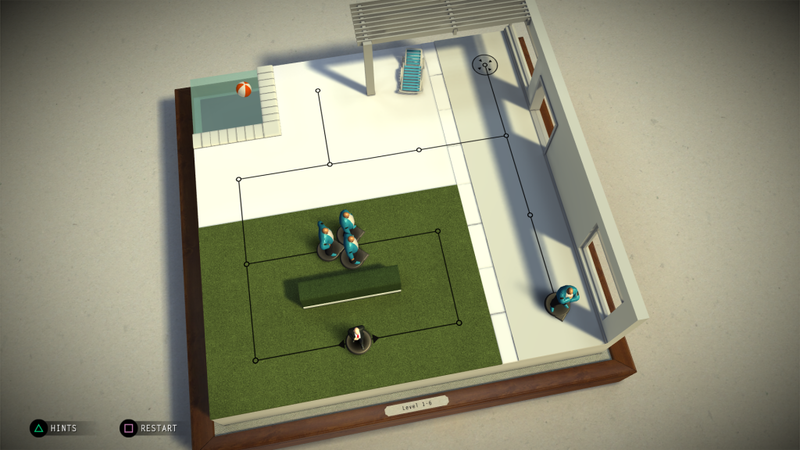 Not only is the board occupied by our lone killer, but also a number of guards and civilians. In some scenarios it’s a case of skirting around the other models; in others you may need to remove them from play by taking the space they’re occupying. 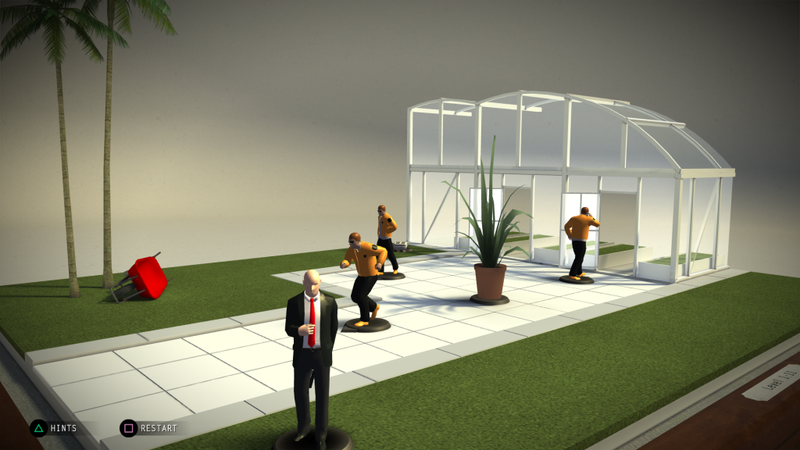 It’s worth noting that Agent 47 always moves first, the other models afterwards. This is key to survival. If Agent 47 moves into a space that is directly adjacent to another model and in it’s line of sight, it’s back to the beginning with our stealthy assassin. 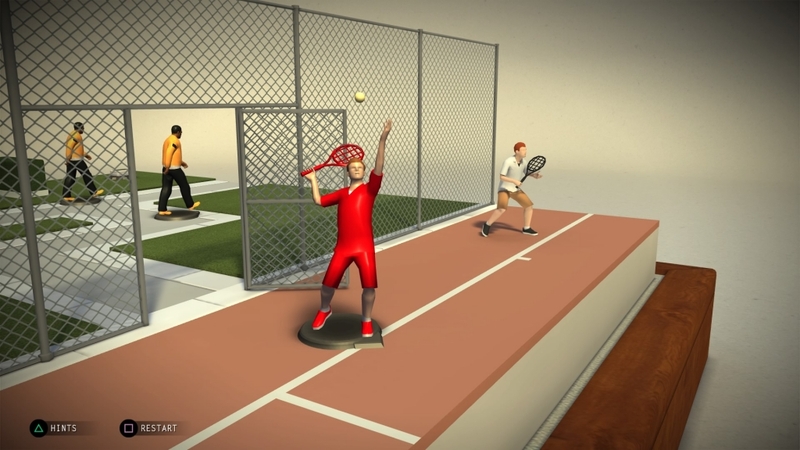 As you progress more tools are added to assist players in making their way across each level. 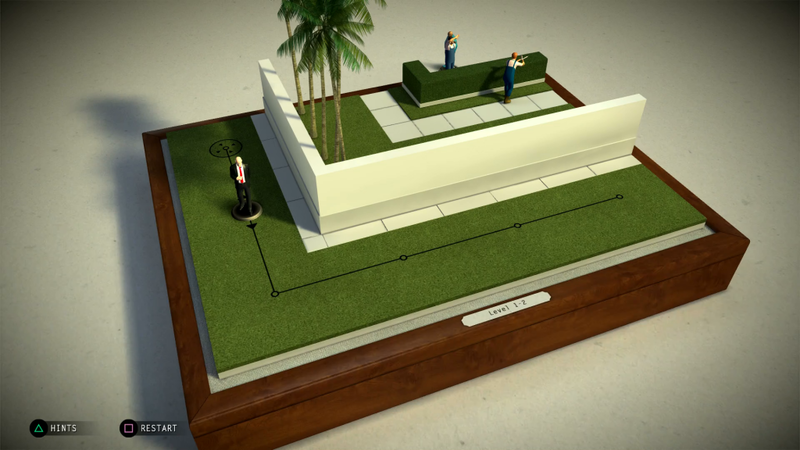 The humble rock is used to distract guards and to move them onto a different path leaving the escape route clear, where a trapdoor will allow Agent 47 to pop up on a different section of the map. 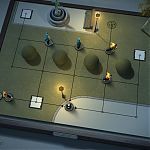 Utilising these simple additions are often key to completing a level; it also adds in a subtle level of puzzle solving while keeping in line with the franchises overarching theme of cunning and subterfuge. Each level has three varying challenges to complete which are represented as stamps on game cards. Completing the level will always provide you with a single stamp, but the game offers two extra for completing certain challenges. 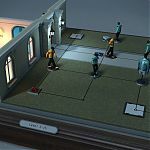 For example, completing the level in a predefined number of moves may yield an extra stamp, or completing a level without ‘killing’ another model on the board may reward the player with another. These stamps are in turn used to unlock more ‘expansions’ to the boardgame, adding more levels. 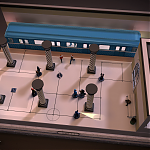 It’s this part that shows the games humble roots as a mobile game; to progress you’ll often need to replay the same levels to make sure you have the required number of stamps to proceed to the next host of missions. 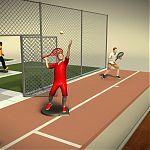 Some times players will be required to complete the same level a number of times in order to complete all three oft he challenges. I found that due to this, the game could feel a little repetitive. As a result I feel it works better as a portable game where it would be played in short burts. 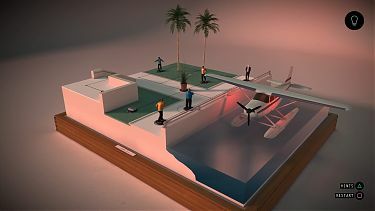 Although the levels are well designed and offer a number of different tactics to complete a mission, the game overall lacks verity. 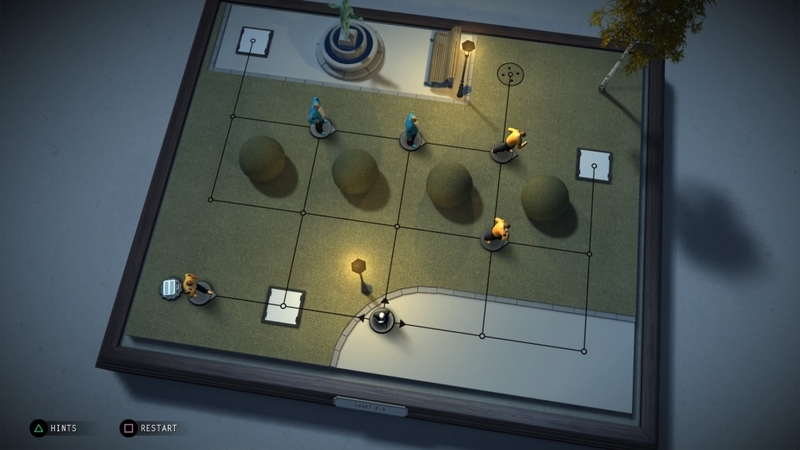 The game design, in contrast to the main series of games, is very bright and very stylised. It’s almost clinical, especially with the sharp whites against the angular features of the gameboard. It’s a nice change from some of the darker level designs found in the main franchise but it further emphasises the difference between the two types of games. There is no ambient music during gameplay, so the sound of the figures scraping against the gameboard does start to grate after a while. 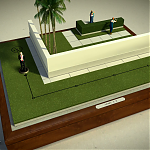 Overall I am not entirely convinced that Hitman GO warranted a Definitive Edition on the PlayStation 4. It works well on the Vita and I feel the 3DS would benefit from it as an eShop title. 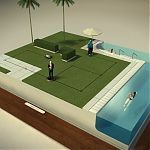 The game is visually appealing and it’s obvious that great care has been taken to make sure it fits within the Hitman franchise but at the same time it stands on it’s own as a clearly different type of game. 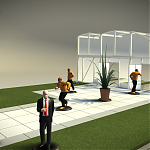 If you’re a huge fan of the Hitman series you’ll probably be a bit disappointed, but as a puzzle game, I couldn’t fault it. 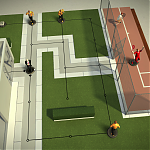 A solid puzzle game that borrows it's big brother's reputation. Detach it from that and you have a solid game that is bound to test your cognitive skills. 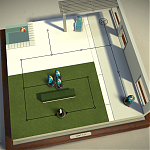 This review is based on playing the PlayStation 4 version of Hitman GO: Definitive Edition that was kindly provided for review purposes by Square Enix.